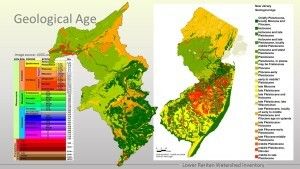 The land that is now New Jersey is relatively young, less than 100 million years. Movement of tectonic plates forced up the mountains to the north and west of the Highlands region, and erosion from that region flowed south to form the Piedmont and the inner coastal plain. The formation and recession of shallow seas in what is now the coastal plain deposited ocean sediments and sand; volcanic activity flowing between and over the shifting plates formed what we now know as the Watchung Mountains. 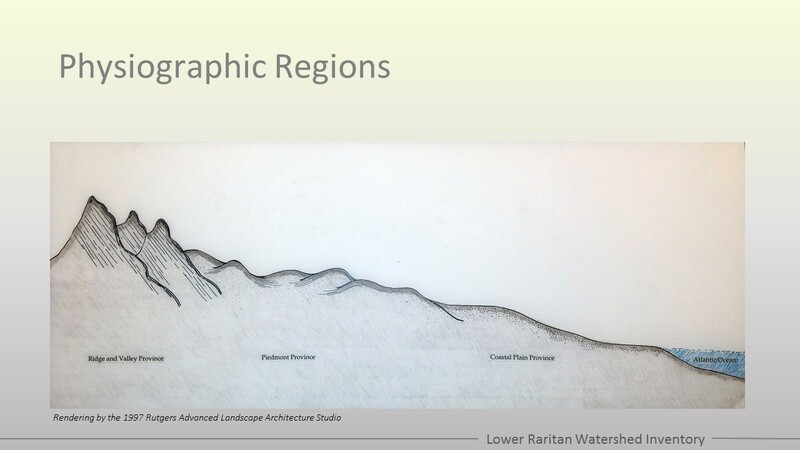 Stretching from the Watchung Mountains in the northern reaches of the watershed almost to the pine barrens at the southern tip, the watershed covers three primary physiographic or ecoregions: the Highlands, the Piedmont and the Coastal Plain. Ranging in elevation from almost 1000’ to sea level, each region has distinct characteristics of elevation and soil type, forest canopy and species diversity. The Watchung Mountains are characterized by steep, mostly forested hillsides; the Piedmont is a more gently rolling surface of rich soil and high plant diversity; the Coastal Plain begins to flatten out toward the ocean and has its own uniquely adapted plant community. 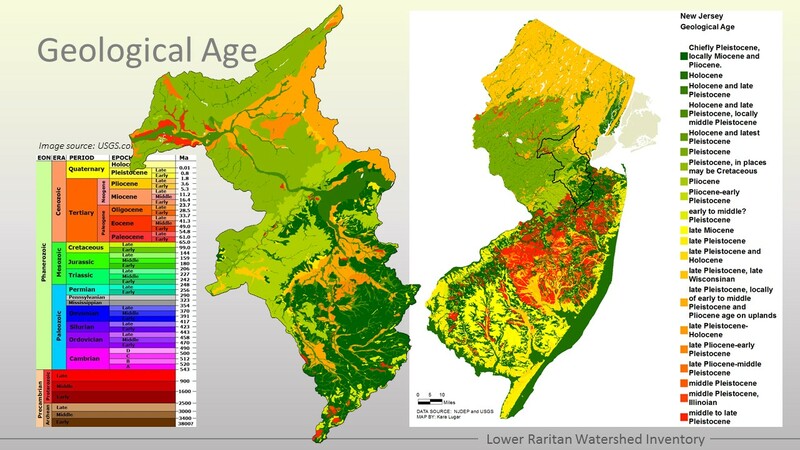 The broad range of elevations, ecotones and species diversity make the Lower Raritan Watershed an interesting and dynamic site. 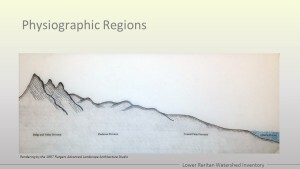 The changes in elevation are related to the underlying geology, reflecting the physiographic regions. 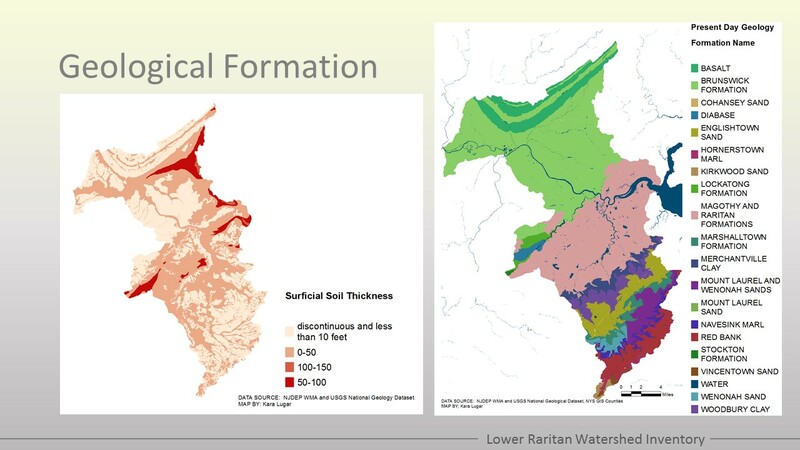 Rockier to the north, running to loamy soils in the Piedmont to sandy soil in the coastal plain, changes in bedrock and soil composition affect runoff and erosion rates, soil drainage and water recharge capacity. Existing bedrock composition influence surface activities like agriculture and resource extraction. For example, clay deposits in the south central portion of the watershed are used for the manufacture of brick. Topsoil depth is also an indicator of erosion and soil health. Soil levels vary naturally following the bedrock formations, but can also be affected by development, agriculture, mining and extraction. Surface soils are also a key filtration point for runoff as a source of groundwater recharge. The ability of different geological formations to hold water leads to the establishment of bedrock aquifers. 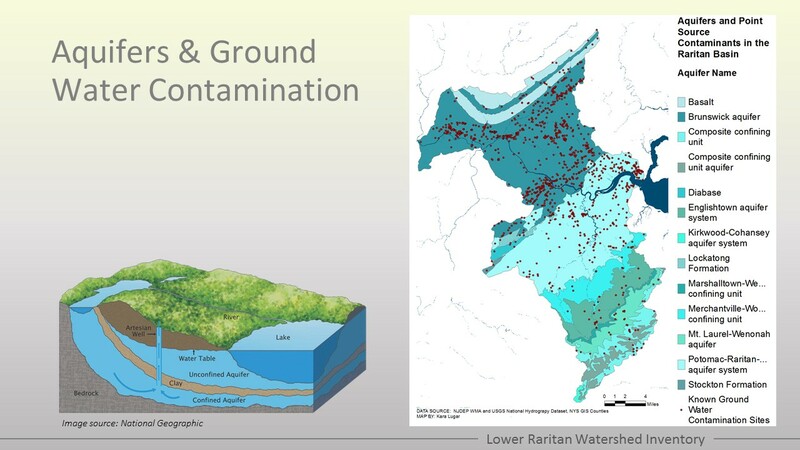 Shallower aquifers- those with less bedrock and topsoil above- are most likely to be drilled as a water supply, but are also more susceptible to contamination. Ground water recharge is the process of surface water infiltrating the sub-surface layers and reentering the aquifer. Contaminants on the surface affect the quality of this water as it makes its way back into the aquifers.